14 Vuelta a Colombia S.M. It's 5:15 a.m. in Cartago, Colombia, a small city of 130,000 in the state of Valle de Cauca. Oscar and I are leaving his parents' house in the dark on our bikes and heading into to the city "Centro" to meet a group of cyclists to do the daily group ride called "El Machete". First stop is the only panaderia open for a few cups of cafe "tinto oscurro" (black and strong) and a few bunuelos (a hole-less donut). We meet the group and head out at 5:45. By the time we hit the main road we are a group of 60. I couldn't believe how big this group was for a weekday morning in a relatively small city. I was told that on weekends the size of the ride doubles. And as expected, the ride was quite spirited. After the ride Oscar and I continued to ride with a bunch of juniors, around six, climbing out of Cartago on the main road toward Perreira. The countryside was filled with lush green meadows, cattle grazing, palm, banana and platano trees. This is cycling Nirvanna. Colombia is blessed with abundant rain and warm weather creating multiple growing seasons and a lush green countryside. I love to cook and a visit to the local market was a revelation. I saw and tasted many fruits and vegetables I had never seen nor heard of. There was granadilla, guanabana, chayote, aracacha, maracuya, guayba, sapote, nispero, and more. Colombians have an intense passion for cycling. 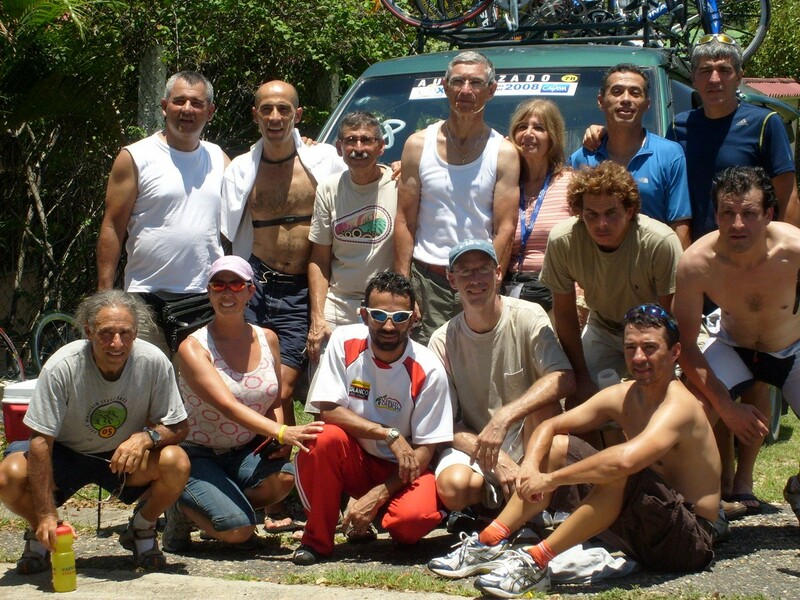 We had just competed in La Vuelta a Colombia Senior Master, a seven day stage race for amateur masters racers. I have been racing in the Northeast for the past seventeen years, competing in one day and multiday stage races but this race outclasses them all. We raced on completely closed roads. As the different racing groups passed schools, the students were on the side of the road cheering us on. At times truckers had to wait till we passed and they too were supporting us enthusiastically. There is a race caravan with support vehicles like a pro race. Results are broadcast throughout the country and the daily podium presentations are complete with two podium girls. The race organization manages to find excellent hotels at a reasonable fee. The competition is tough with many former Colombian professionals and racers coming from Europe. And then you have the issues of racing in the heat and sometimes at altitude. The racing is aggressive right form the gun and even the flat stages have plenty of small hills to negotiate. When racing in Colombia you never know what to expect. Every year the routes are different. The encounters with the locals are always interesting. This year the race began in the resort city of Melgar. We were fortunate to stay in a luxury hotel run by the major sponsor, Cafam. And as expected the prologue had its usual craziness, a few tight technical turns, a bunch of speed bumps and a small hill to power up. This year we came to Colombia with nine racers from the metropolitan NY area. Our club, the Cafeteros Cycling Club, is a combination of Colombian-Americans and a bunch of Gringos like me who share a passion for bicycle racing. We were fortunate to have Oscar's brother, Fernando, who lives in Armenia, do a lot of the pre-race logistics. We arrived in Bogota and spent the day and evening with his many cousins, assembled our bikes with our master mechanic Pichon and our main support driver Pechuga and did some sightseeing. Both Pechuga and Pichon have worked for many of the big stage races in Colombia. They are so experienced at getting us to the races with our bikes in great condition. But even better they kept us laughing and joking. Our bike cases were shipped to Armenia, where the race was going to end this year, in one of Oscar's cousin's truck. We would have been lost without the help of these two wonderful guys and all of the pre-race arrangements. The first stage was flat by Colombian standards, an out and back course with a bunch of small hills that can tear your legs off. It had rained heavily the night before and early morning so there was a quite a bit of mud on the roads. And being that it was an out and back course, at times we didn't have a whole lot of room to maneuver with one peloton going in one direction and the other coming in the opposite. I hit a pothole with four kilometers to go and flatted. I drifted to the back of my field and saw that there was no way my car could get up to me and change my wheel so I kept on going and much to my surprise I was able to finish with the field. Thank you Mavic. We finished stage two, a time trial, in the small town of Narino. This pueblo was really small. The roads were closed in both directions so we couldn't go back to the start till all 350 plus riders finished. So here we are in this little town with all these thirsty racers on a very hot day. It didn't take long before the town was out of beer, soda and bottled water. I had three beers and it wasn't even noon yet. Lucy, the wife of one of our racers, found a place for lunch at the far end of town and we feasted on soup, roast chicken, rice and beans overlooking the town square with beautiful mountains in the distance. Stage 3 finished in the city of Ibague. It was a hard hilly stage with big time gaps between the racers. The last kilometer was lined with people cheering us on as we finished. But the highlight was the post race lunch, Guanabina, a fruit I had never had before (delicious) roast chicken and yucca. The views from the restaurant looked over the valley and they were magnificent. We then transferred to the next hotel which became a 3 hour plus ride through the mountains on the famous La Linea climb. This climb is 40 kilometers long and is used in the Vuelta Elite. The mountains are steep, very green, and filled with waterfalls, a spectacular ride. Many legendary rides have been done on La Linea. The climbing is endless and the descents are hair-raising. Our next hotel, Las Camelias, was idyllic. The dining area was open with just a roof. Behind the hotel was a grove of platano trees and down the road was Park del Cafe, sort of a living museum devoted to coffee. It recreates an old coffee plantation. This part of Colombia was in the heart of the coffee growing region and is known for being quite beautiful. A Vuelta wouldn't be complete without a hot long stage and stage four was it. By the time we finished I felt like a chicken slowly roasting on a spit. It was 115 kilometers of hot potholed roads with grabby pavement. I made good use of my support car going back multiple times for many water bottles. Stage five was the major climbing stage finishing with a four kilometer climb to the beautiful mountain town of Salento, topping out at 2000 meters. Of course we had plenty of climbing before we made it to the final climb. This part of Colombia is special. Just below the town is the national park, Valle de Cocorra. This old colonial town is filled with work by artisans and the park has beautiful mountain meadows and foliage with plenty of hiking and mountain biking trails. The last stage was the usual crazy circuit I have come to expect in Colombia. It was 2.7 kilometers long, a few hills, 12 turns, narrow roads, pot holes, stray dogs, elderly people crossing on the course, speed bumps and a pile of horse droppings in the middle of the road. It was fast, hard and exciting. On a personal note I was having a great race till I crashed. I quickly remounted my bike after straightening my handlebars and was back in the race and realized after a few minutes that I severely fractured one of my front teeth. How ironic me being a dentist. Thoughts of needing an implant raced through my head, but first I had to finish the race. Well I did finish and headed right off to the infirmary. This was a relatively small city and they did not have a bona fide hospital. They cleaned my wounds and put in a bunch of sutures. The bill was a whopping $35 which was reimbursed by the race organization. But I still needed to see a dentist or in Colombia an Odontologico. The next day Oscar's brother, Fernando made arrangements for me to see his dentist, a cycling buddy of his. I knew from treating my Colombian friends in New York that Colombian dentistry is quite excellent so I entered the dental office with little trepidation. The dentist and I had a great time. He was able to understand my broken Spanish and I saw that the procedures and equipment were first rate. He prepared my tooth for a crown and made a beautiful temporary crown. I felt whole again. I was so grateful for his care and he so much appreciated the compliments from a fellow practitioner. Colombia sends many professionals to race in Europe. They have won world championships and finished high up in the standings at the Tour de France. After spending time in Colombia I can understand why. The cycling culture here is huge. You can find champion racers from small poor little pueblos as well as the more affluent cities. The terrain is ideal with climbs that go on for 20, 30 or even 40 or more kilometers. You see juniors being motor paced at a very young age. The weather is ideal, cyclists ride year round. This small country of 44 million has at least five velodromes that I know of. For comparison New England and the Mid-Atlantic states have only two. The older racers and non-racers are up early for their daily group rides. In Cartago the ride goes 6 days a week. Some days are flat and fast and other days are for climbing. Weekends are for longer rides. Colombian cyclists are a very tough lot. Though the weather is mild it does rain a lot. And it can be very, very hot. They love sport in general and love competition. Many of their top racers come from very humble backgrounds. Cycling can be a way out of poverty. The best are worshipped as national heroes. Contrast with this country where everyone knows about Lance Armstrong, but how many know about Levi Leipheimer or Chris Horner or even George Hincapie (a Colombian-American)? Our best racers get very little recognition; not true in Colombia. I was fortunate to spend a week after the race with Oscar and his family. Mornings were a delight with fresh arepas (corn my favorite) cafe tinto, fresh juice and eggs and hot chocolate or cafe con leche. You can hear the roosters crowing in the morning so I am sure those eggs did not travel too far. Oscar's mom prepared a wonderful midday meal and of course we had to take a little siesta. And at night his many siblings and cousins would come around and hang out. The days in Cartago are hot but at night it cools off. Their house is across from a park and from late afternoon into the evening there are many kids either on their bikes or playing soccer. It reminded me of how I grew up, playing in the street after school and after dinner. I don't see that too much were I live now. I got to know Oscar's family quite well. Three of his brothers and his brother-in-law are enthusiastic cyclists who if they had the time would have raced with us. His father and mother just took our early morning rides as par for the course. I was lucky to spend my last morning riding out of Armenia, a larger city than Cartago, with another group ride of 50+ riders. I later found out that this was just one of many weekend group rides. We rode fast, regrouped and then did a really tough climb to the town of Buena Vista. Had some coffee in town, then before we ended this four hour ride we stopped for fresh squeezed orange and carrot juice and banana bread. Colombia is a country of contrasts. One minute you see a late model German car on the road and the next a horse drawn cart. But what is clearly evident is a passion for cycling and the enjoyment of life.